Picture this: you and your family are sitting down at the dinner table after a long day, armed with forks and knives, ready to chow down on some grub. Suddenly, you feel something warm and fuzzy brush against your feet. You immediately know what it is, and as you look under the table, your eyes lock with that wide-eyed puppy staring back up at you, just desperate for a bite. They’re not looking for much, just a few table scraps to satisfy that sweet puppy belly. I mean, wouldn’t it be cruel to cook up a delicious-smelling meal and not let them try a bite? I know I’m guilty of giving into that furball under the table. But, even though I want to spoil my dog, I know that has to be done in moderation and with only a few types of food. Yes, it’s hard saying no to those desperate eyes, but it’s for their own good! And, it’s even more tempting to give into that adorable pooch during the holiday season, but it’s important to stand your ground and say “no”. 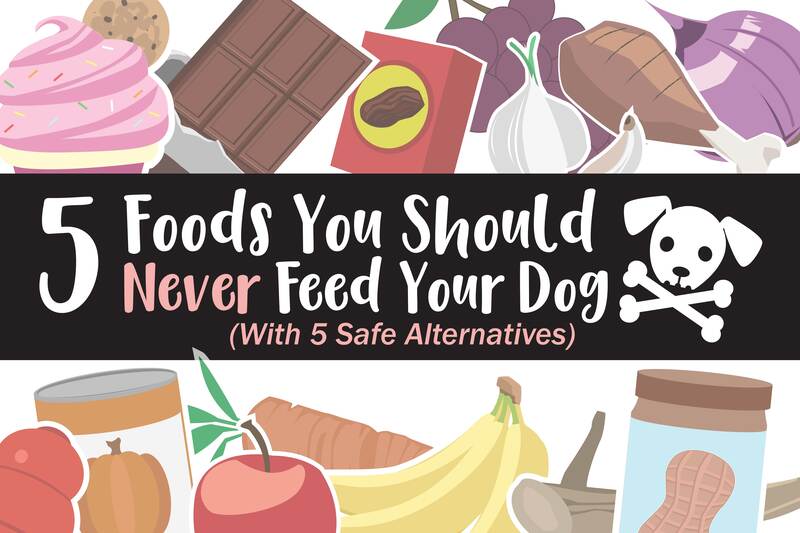 We want to help you keep your furry friend safe, so we compiled a list of 5 foods that you should never give your dog followed by a safe option you should consider instead. This one is tricky but oh-so-important! Believe it or not, xylitol can be found in some brands of peanut butter, that’s why it’s crucial to always check the label before giving Fido a spoonful of their favorite sticky treat. Xylitol is a sweetner typically found in candy, gum, baked goods, and many diet foods. This chemical can cause an imbalance in your pup’s blood sugar and, in serious cases, can even lead to liver failure. Safe option: Find peanut butter that doesn’t contain xylitol (brands that say “all natural” typically don’t contain this chemical, but always double check). I’m sure your dog will always be up for a spoonful of that! 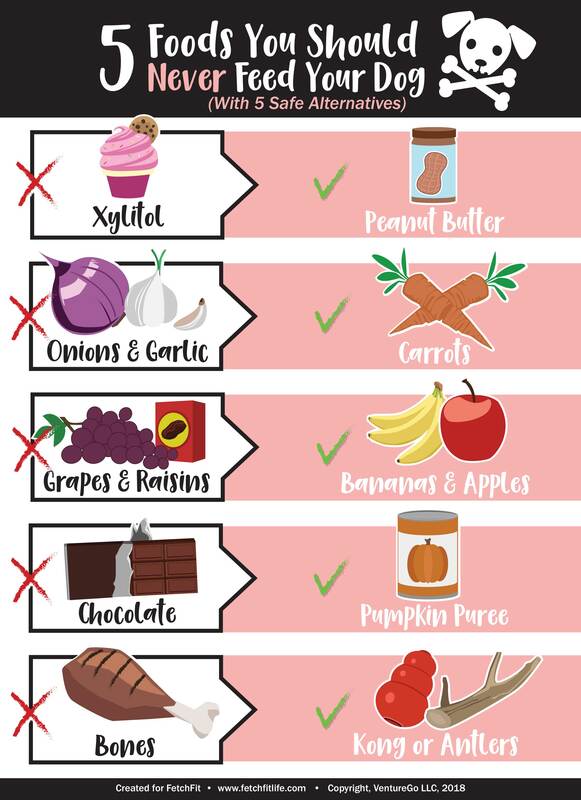 Now, I’m sure you would never give your dog a whole onion or clove of garlic to munch on, but these dangerous ingredients are mixed into a whole bunch of foods that we might not even think twice about feeding to our pup. All forms of onions and garlic (raw, cooked, powdered, etc.) can be dangerous to dogs because they wreak havoc on their red blood cells. Safe option: Instead of giving your pup something that may contain traces on onions or garlic, try giving them few plain carrots, either steamed or raw. Carrots are a great, nutritious vegetable for dogs to enjoy as long as they are completely plain and free from seasoning. Even if you’re tempted to feed your dog some fresh grapes off of an overflowing fruit tray, DON’T! Many pet parents don’t realize that grapes and raisins can lead to kidney failure in dogs. And, the scary thing is that just a small amount of this toxic fruit can cause a lot of harm to your furry friend. So, if your dog has a tendency of sneaking food off of the counter, really double check to make sure there are no grapes or foods that contain raisins within their reach! Safe option: Grapes and raisins may not be safe for dogs, but apples and bananas sure are! Try giving them a few pieces of these dog-friendly fruits the next time they’re begging for something sweet. Now, all of us should know by now that dogs aren’t supposed to have chocolate, but that doesn’t stop some pet parents from allowing their dog to take a little bite of something that has this toxic ingredient. I mean, chocolate is so good, just a little bit won’t hurt them, right? WRONG! Chocolate contains theobromine which can cause a variety of health issues including heart problems, tremors, and seizures. And, it’s important to know that theobromine is found in all types of chocolate, including white chocolate. No matter how much you love chocolate, never ever under any circumstances give your dog a taste! Safe option: Pumpkin puree (which is only one ingredient: pumpkin. Make sure to buy the puree and NOT the pumpkin pie filling) is a safe and delicious food for your pup to enjoy. Not only that, but it can also help ease stomach aches and be beneficial to your pup. You know that old saying “give a dog a bone”… but that’s probably not be the best idea! If you cook yourself up a steak or some chicken wings, it may be tempting to throw that bone under the table for Fido to enjoy. However, small bones like this are easy for dogs to choke on. Not only that, but they can splinter, which may lead to painful cuts or blockages within your pup’s digestive tract. Safe option: You may not be able to give your dog a bone from the dinner table, but there are plenty of dog-safe bones and chew toys on the market for them to enjoy. I usually end up giving my dog an Elk Antler to keep her busy. Not only does she love them, but they last a long time! Now, make sure to get the appropriate size for your dog and keep an eye on them while they are chewing to make sure they don’t choke or cut themselves as some of these treats can have sharp points. So, next time you see your dog waiting under the table for some scraps, I hope you have the willpower to stand strong and not give into those begging puppy dog eyes. But, every good girl and boy does deserve a treat, so make sure to keep these dog-safe options on hand. Remember, a healthy pup is a happy pup! Did you find this story helpful? Do you have any other dog-safe food options that your furball enjoys? Let us know so we can let others know!